Consider the alternative – the Aurender N100H or N100C seamlessly replaces your aging computer. Your music will now be stored on the N100’s internal hard drive, available in either 2TB or 4TB capacity with a 120GB solid state (SSD) caching drive performing all file playback for superior fidelity and reliability. Management of your digital music library and Tidal lossless streaming service is simple and intuitive, thanks to our award-winning Aurender Conductor app. And all major digital file formats are supported at native bit and sampling rates. Housed in beautiful machined aluminum casework, either N100 version will compliment your existing system components and deliver a new level of musicality you have to hear to believe. The Aurender N100H Caching Music Player and Streamer is equipped with a high-performance USB digital 2.0 Audio output that will interface with your DACs USB input. The N100C has both USB and SPDIF digital coaxial (RCA-type) outputs, providing additional connectivity options with, for example, legacy DACs that don’t have a USB input or to interface with active loudspeakers with built-in D/A convertors. Either model can be specified with 2TB or 4TB storage capacity and silver or black finish. The N100H and N100C digital music players incorporate technology derived from our best-in-class models. For example, the solid-state (SSD) 120GB caching drive for playback eliminates latency and the potential of drop-outs often associated with using IT storage devices like NAS and USB drives for music playback. 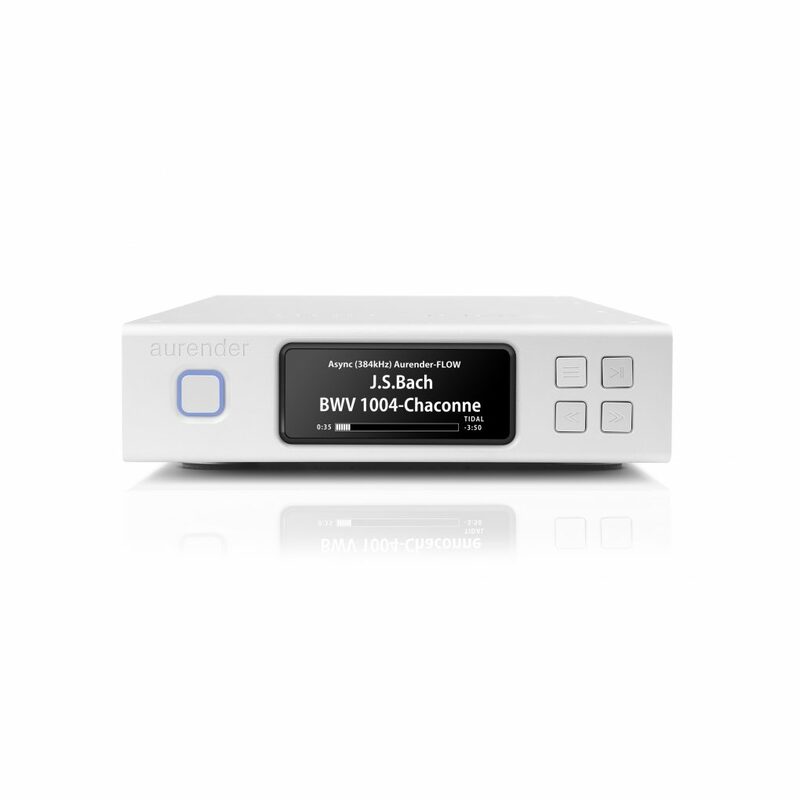 And our dedicated high-performance Audio 2.0 USB digital audio output features ultra low-noise power circuitry to deliver a pristine digital stream to the connected DAC. The N100H and N100C greatly benefit from “trickle down” technology from our far more expensive models making them both deliver audio performance that belies their cost. Loading music into your Aurender is simple and easy. You can choose between one of two methods depending upon where you digital music library currently resides. If your music is on a USB storage device, simply plug it into one of the two USB ports on the rear panel and from the Aurender App select “Copy All to Aurender”. If your music resides on a NAS, you will need to attach the drive internal to the Aurender to the network using a computer. Once the folder for the internal drive is visible on your desktop, you may transfer music into it by cut and paste or drag and drop. Alternatively, for either method, if you just wish to transfer just specific folders, Smart Copy can be performed using the Conductor App. After a song or album is selected from the Aurender Conductor App, that specific song or album is cached to the 120GB SSD from the internal HDD and the N100 will then playback from the SSD. This minimizes wear and tear on the HDD drive as after loading to the caching drive the HDD goes idle. Additionally, by caching songs to the SDD for playback, it eliminates any sound quality degradation and even drop outs due to a non-optimal network connection from for example, a NAS drive to the Aurender. In the unlikely event you may need technical support, you can do so right from the Aurender Conductor App. Sending a Remote Support Request from our app allows engineers to quickly diagnose and fix problems over the Internet, should they occur. Filter your music by title, artist, composer or genre.